Black Mage is a job class from the Final Fantasy series of games. They are characterized by their distinctive appearance—blue robes and a face shrouded in shadow beneath their pointed hat—as well as their practice of Black Magic, which consists of various offensive, elemental spells. An individual representative character appears in Mario Hoops 3-on-3 and Mario Sports Mix, games developed by Square Enix, creators of the Final Fantasy series of games. He is one of several characters based on Final Fantasy, the others being Ninja, White Mage, Moogle, and Cactuar. He has a magical staff which he only takes out when using his Special Shot. He is classified as a Tricky player, meaning he makes very swift moves to dodge tackles. In Mario Hoops 3-on-3, he is unlocked by winning a Gold Trophy in the Rainbow Tourney on the Normal difficulty. An alternate costume can also be unlocked by completing the Rainbow Tourney on the Hard difficulty. This alternate costume gives Black Mage a green and black color scheme. The Black Mage, along with the other Final Fantasy characters return in the Wii follow-up, Mario Sports Mix. He is unlocked by clearing the Star Road 3 times, winning the Star Cup 4 times, or by clearing a specific mission on the Mushroom Cup. His best stat is technique, while his other stats are fairly low. On a side note, Black Mage's stats in Mario Sports Mix are identical to those of Daisy and Waluigi. Like in Mario Hoops 3-on-3, the player can also unlock an alternate outfit for the Black Mage. Here, it is unlocked by clearing a certain mission on the Star Cup, clearing the Star Road 6 times, or by using Black Mage 20 times. This alternate outfit depicts the Black Mage wearing a red outfit and hat, with a belt being added onto the hat, along with a yellow cape. The outfit details are also different. Black Mage can use his special shot to briefly shrink his opponents. He then follows up by aiming the ball/puck at the goal, or at an opposing player. In Basketball, Black Mage is a very slow dunker, but his layup move is unique in that he'll cast a spell, which makes the basketball almost always enter the basketball hoop. In Volleyball, Black Mage's fully charged shots move quite fast, while also curving. However, these shots can easily go out of bounds, which would make Black Mage lose points. He can also summon a thunderbolt to block volleyball shots, but the range is limited. 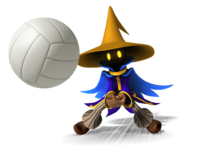 Instead of diving, Black Mage can cast a fire spell to catch a volleyball that's out of reach. Black Mage's fire spell can range up to 3 meters (gamewise). In Dodgeball, Black Mage can repel dodgeball attacks by summoning a thunderbolt to block the dodgeball. However, this move is rendered useless if the dodgeball is equipped with an item. Instead of diving, Black Mage can cast a fire spell to bring the dodgeball to him. His full power throws are given an added curve, which can be used to throw off opponents. In Hockey, Black Mage can take down his opponents by striking them with a thunderbolt in his powerful check. If the opponent is faraway, he will cast a fire spell instead. While charging the ball he uses his dark magic to make a powerful shot. Since he has good technique stats, he can score easily by faking the goalies or doing combos. Black Mage's artwork for Mario Hoops 3-on-3. Black Mage's mugshot in Mario Hoops 3-on-3. Black Mage's sprite from the character select screen in Mario Hoops 3-on-3. The Magic Red alternate outfit, as seen in Mario Sports Mix. Black Mage's Special Shot in Hockey. Mario Sports Mix mugshot (Magic Red outfit). Mario Sports Mix CSS icon (Magic Red outfit). An animation error that the Black Mage has. The Black Mage may be related to the Dark Mage mentioned in Super Mario RPG: Legend of the Seven Stars, as it also originates from Square. The Black Mage's alternate outfit is a reference to another character class from the Final Fantasy series called the Red Mage. In Mario Sports Mix, during the 3-on-3 Hockey introductions, the Black Mage's hockey stick is seen floating with him. This is likely an animation error, as he's not supposed to have it. In Japanese and internal files of Mario Hoops 3-on-3 and Mario Sports Mix, he is named "Kuroma". The same applies to his partner, White Mage, whom both games call "Shiroma". This page was last edited on April 20, 2019, at 16:40.